Toyota had the most coverage at the 2017 SEMA Show as per Fullintel’s comprehensive media coverage report. Our analysts ensure that customers get the most appropriate and contextual media intelligence possible. The analysis involved studying more than 2 million impressions on Twitter and online to ensure 360 degree coverage. Leading media monitoring and analysis firm, Fullintel, published an analysis of the top activities at the 2017 Specialty Equipment Market Association (SEMA) Show in Las Vegas. Taking place from October 31st to November 3rd, the SEMA show drew more than 70,000 international and domestic attendees and scored thousands of mentions in the media. Nearly 2,400 exhibitors participated in the show and over 2,500 new products were on display this year. Fullintel’s media analysts curated more than 4,000 stories from both traditional and social media from the vast coverage to study the media impact of the show. “Our analysts ensure that customers get the most appropriate and contextual media intelligence possible. The analysis involved studying more than 2 million impressions on Twitter and online to ensure 360 degree coverage,” added Andrew Koeck, Co-founder and President of Fullintel. 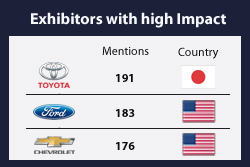 Using an infographic design, the Fullintel media coverage report compares the mentions received by top exhibitors by region and by outlet. The report also highlights the top journalist who covered the SEMA show and the impact that was registered across social media. The report also provides interpretations of the sentiment of stories written on the show. A copy of the report can be downloaded from this link.